Think about this: If you have a good experience with a company then you might tell a couple of people. If you have a bad experience, you probably tell a lot more people. Right? This is why in your interview it's likely that you will be asked behavior based questions about your customer service orientation. "Customer Focus" is crucial in business these days; especially in the age of social media when it's so easy to complain publicly. 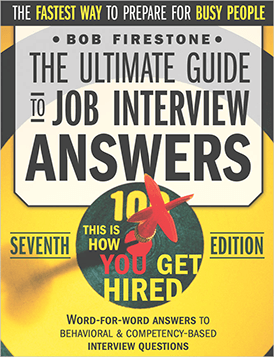 Here's how to prepare to give the best answers to customer service interview questions. Remember, even if you are not in customer service, you always have a customer. That customer might be your boss. Or it might be another department. Or it might be a client or an actual customer at a retail or service business location. No matter what you do, modern HR people are going to be looking for behavioral competency in customer service orientation. So, what is good Customer Focus exactly? Understanding people and their expectations. Doing whatever it takes to for the delivery of products or services to meet those expectations. Identifying and solving customer problems quickly and to the customer's satisfaction. Developing and using ways to measure, keep track of, and maintain high levels of customer satisfaction. This last bullet point is a great tip for you. If you can show to the hiring manager that you have developed ways of measuring and tracking customer satisfaction, then you are really going to impress them. This is advanced business thinking. You’re showing that you use data to measure your objective of keeping customer service levels high. Try to think of examples from your work experience where you kept track of the work you delivered and gauged the recipient’s satisfaction with the quality and timeliness of the work. Were there changes to the work product or your delivery that lead to LOWER satisfaction? … And were you able to detect this because you were measuring and keeping track? … Then what did you do to “course correct” and make sure satisfaction went back up? HR people love behavior based answers like this. Have you ever created policies or procedures related to customer service? I’m sure you have. At some point in your career probably someone was not happy with your work, or the work of your department. You had to make small changes to correct this, and maybe some of those changes became a new “standard operating procedure” to serve the goal of customer focus. Even better if you documented them, made them official, and communicated them to your teammates. Think about these situations from your past work experience. Write them down now. These are great examples for your interview answers. What about important clients, or complex or sensitive customer relationships? If you can show that through your customer service orientation you saved the company from losing something of value (a big client, $X amount of revenue, 20 man hours a week) then you will really demonstrate your customer focus. Or did you save the company a political, organizational, or image problem? Write it out. What was the situation? What action did you take? How did you communicate to your teammates and how did you communicate with the customer? What was the result? … I hope this gets you thinking. Show you are a leader. Were you part of coming up with new business processes and implementing changes across your department or company-wide in order to support the MEASURED goal of increased customer satisfaction? Remember, your customers could be internal or external customers. Did you try to foster a culture of customer service? Again, HR people love hearing this type of stuff. Think about your past work experience and the examples above. Now think about how you might answer the following questions. "Please provide me with an example of how you solved a customer inquiry at your previous job. What were the exact steps you used from the time you began the conversation to when the inquiry was resolved?" Your analysis of the root of the problem; including how you went about asking questions and discovering everything involved in the issue. How you identified and managed customers expectations that were not being met. How you communicated (written, verbal) with the customer, your teammates, and other stakeholders. How you measured that your objective was achieved. "Tell me about a time when you established an agreement or a partnership with an internal customer so you could both achieve your business goals. What steps did you take? How did it turn out?" "Describe a situation where you made changes to standard procedures in order to increase customer satisfaction metrics. How did you get support for this? What constraints did you face? How did you measure the outcome?" If you’ve dealt with these companies, think about how you were treated by them. Think about your experience. Most people can relate to having a good experience with one of these companies, so choose one or two to use in an example after you have told your own “experience stories” related to your customer focus behavioral competencies. — Understand that Customer Focus is a core behavioral competency that all modern HR departments use behavior based questions to ask you about. — Come up with step-by-step examples from your work experience where you had to identify and manage customer expectations, communicate clearly with all stakeholders, MEASURE your results, and contribute to a culture of customer service overall. — Write it out! You’ll remember it better that way.☺ If you liked this article, please share it on your social networks.